Low level laser hair therapy (LLLT) is a non-surgical, revolutionary breakthrough treatment method for both men and women suffering the devastating effects of hair loss. With laser hair therapy, you can achieve thicker, fuller, shinier, and healthier looking hair. Light from a laser has an effect on your body when the specific wavelength of light is absorbed by molecules of the target tissue. When light energy is absorbed by target tissue molecules, the energy level of the molecules is increased and the molecules respond by "working off" the excess energy with adaptive changes. These changes may be chemical or physical and they may have biological effects on the target tissue or surrounding tissues. Low level laser therapy treatments utilize a device containing over 100 therapeutic soft low level light lasers which deliver light energy directly to the scalp. A new study published in the International Journal of Cosmetic Surgery and Aesthetic Dermatology showed a 93% male increase in hair among the respondents using Laser in the study! SAFE - LLLT has been used clinically for numerous ailments in Europe for over 35 years and has been the subject of over 3,500 scientific papers, published worldwide. LLLT is approved for Safety by the FDA. 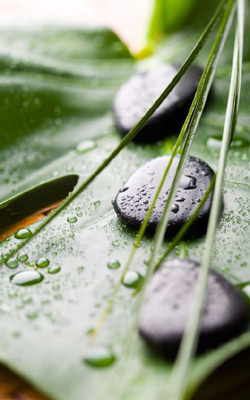 There are no reported side effects to the therapy which is painless, non-toxic, and complements many traditional therapies. There are no known side effects. Cold lasers are infrared lasers that do not have a thermal component so they will NOT vaporize or burn tissue. Increases the diameter of existing hair shafts. Promotes new hairs from viable follicles. Increases tensile strength (your hair's resistance to breakage). Increases hair length by 30% faster. Physician study proved increase in hair count after 3 months using Laser Bio-Stimulation. 93% increase in hair among the respondents using Laser in International Journal of Cosmetic Surgery and Aesthetic Dermatology study. 40% increase in hair growth after using Laser Bio-Stimulation according to a US Study. 100% retention of hairs and a 20% improvement in thickness and density of hair follicles using Laser Bio-Stimulation according to a European Study. 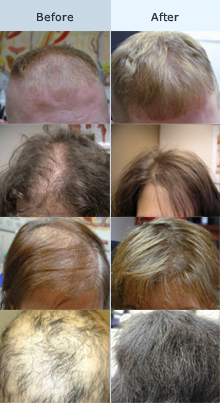 American study proved 100% retention of hair and near 38% hair regrowth after using Laser Bio-Stimulation. While optimum results occur after at least 12 months of Laser Therapy, we want to offer a solution that can be tailored to your own busy schedule. If you'd like to schedule and pay for your Laser Therapy sessions seperately, or would just like to try out the process, this package is for you. This is a good deal if you are still unsure about the process. See what a month of Laser Therapy can do for you. We will provide a consultation where we evaluate your current hair growth and show the progress after just one month of treatment. While the full program takes about a year to complete, results should show up between one and two months of consistant treatment. Recommended for the best results! The 6-month program would be ideal for the customer who wishes to split up the time or cost of the full regimen. This program will produce the best results from the Low Level Laser Therapy, and is highly recommended.